RIO DE JANEIRO, May 6 2017 (IPS) - It cannot be categorically stated that corruption has increased in the country in recent years, because there is no objective information from earlier periods to compare with, according to Manoel Galdino, executive director of Transparency Brazil. But recent revelations give the impression of a drastic increase in corruption, involving unprecedented amounts of money, nearly the entire political leadership of the country, and numerous state-run and private companies. The Odebrecht conglomerate, led by Brazil’s biggest construction company, admitted to having paid 3.39 billion dollars in bribes to politicians between 2006 and 2014. And that is only part of the scandal. More than 30 companies, including other large construction firms, are allegedly involved in the embezzlement of funds from the state oil company Petrobras, the initial focus of the “Lava Jato” (Carwash) investigation launched by the Public Prosecutor’s office, which has been exposing Brazil’s systemic corruption over the last three years. The proliferation of mega-projects in the energy and transport sectors since 2005 coincides with the apparent rise in illegal dealings, with the collusion of politicians and business executives to maintain shared monopolies of power and excessive profits. The 2006 discovery of huge oil deposits under a thick layer of salt in the Atlantic Ocean, known as the “pre-salt” reserves, sparked a surge of mega-projects, such as two big refineries and dozens of shipyards to produce drillships, oil platforms and other oil industry equipment. Those projects came on top of petrochemical complexes that had already been projected. In the following years, two big hydropower plants began being built on the Madeira River, and in 2011 the construction of another huge plant, Belo Monte, got underway on the Xingu River. This turned the Amazon region into a major supplier of energy for the rest of the country. Three railroads, over 1,500-km-long each, ports all along the coast and others on the riverbanks were added to highways in the process of being paved or expanded to reduce the country’s deficit of transport infrastructure. “Mega-projects always have a big potential for corruption. In Brazil we have always had a lot of corruption, which has now become more visible, thanks to the activity of oversight bodies and the media,” Roberto Livanu, president of the independent I Do Not Accept Corruption Institute, told IPS. “But we cannot say that there is more corruption now than before, there is no way of measuring the magnitude, amounts and people involved,” said Livanu, who also works with the prosecution in the judicial proceedings. Because of the very nature of the crime, “we only have subjective perceptions created by the visibility of the cases, which is now increased by the involvement of people in power, attracting much more interest from the press,” he said. Besides, due to their complexity, mega-projects tend to fail – 65 per cent of them fail in at least one of four main aspects: cost, deadlines, objective and quality – says Edward Merrow, head of the U.S. consultancy Independent Project Analysis (IPA), in his book “Industrial MegaProjects”. This complexity, he says, also contributes to corruption, at least in countries such as Brazil, with multiple opportunities for fraud presented by the thousands of contracts signed with suppliers of goods, services and financing, and regulatory and tax authorities. “It is likely that with the greater circulation of money, in a growing economy, with major investments, corruption may have increased in Brazil, but it is not possible to confirm it,” said Galdino, from Transparency Brazil. This is because we don’t know the proportion that corruption represented in the past with respect to GDP, because there was no research that made it possible to obtain the results available today, he explained. “Supervisory bodies have made a lot of progress in the past 15 to 20 years and this is what led to the Lava Jato operation,” also underpinned by a mobilised civil society, Galdino said. The Public Prosecutor’s Office was strengthened and its investigations began to be carried out together with specialised judicial bodies, the Federal Police, tax authorities and financial oversight bodies, since corruption flourishes along with money laundering, he said. The plea bargains that encourage cooperation with the justice system in exchange for reduced sentences were a key instrument for the success of Lava Jato, with 155 such agreements reached with people under investigation. The law allowing for plea bargains was passed in 2013, in response to popular protests that shook cities across Brazil in June that year, said Galdino, the head of Transparency Brazil, a non-governmental organisation whose aim is to improve institutions through monitoring and public debate. “Until the 1990s the focus was on combatting administrative irregularities, but this approach did not lead to jail sentences for anyone,” he compared, citing as an example the case of lawmaker Paulo Maluf, a symbol of corruption ever since he was elected governor of the southern state of São Paulo (1979-1982), but who was convicted abroad, not in Brazil. However, there are studies that show an increase in corruption when there is an abundance of public resources, as well as greater tolerance of those engaging in corruption during times of prosperity. A ten per cent rise in transfers of resources from the central government to small municipalities increased by 16 per cent the serious cases of corruption in the city governments in questions, according to a study by Brazilian economist Fernanda Brollo, a professor at the British University of Warwick, together with four Italian colleagues. The study was based on figures from 1,202 municipalities with a population of less than 5,940, during two periods of government between 2001 and 2008. The mayors who benefitted from the increased funds were re-elected in a greater proportion than the rest, despite the corruption. “He steals but he gets things done” was the informal slogan of a former São Paulo politician, Adhemar de Barros, who governed that state during several periods between 1938 and 1966. In 1950 he was so popular that he was seen as a strong candidate to the presidency of Brazil, but he did not run. Building large works, such as highways, hospitals and power plants has always been a source of popularity, as well as, according to popular suspicion, illicit wealth. 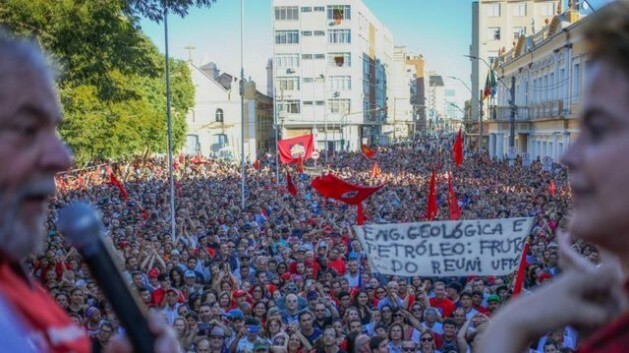 The proliferation of mega-projects during the governments of leftist former president Luiz Inácio Lula da Silva (2003-2011), with dozens of works involving investments of over one billion dollars, in some cases over 10 billion dollars, with huge cost overruns, appears to confirm their direct relation with an increase in diverted resources. Lava Jato initially investigated the oil business. But the corruption affected other projects in varied sectors, such as hydroelectric plants, the Angra-3 nuclear plant (under construction), railways and stadiums built or upgraded for the 2014 FIFA World Cup, according to that and other investigations carried out by the Public Prosecutor’s Office.